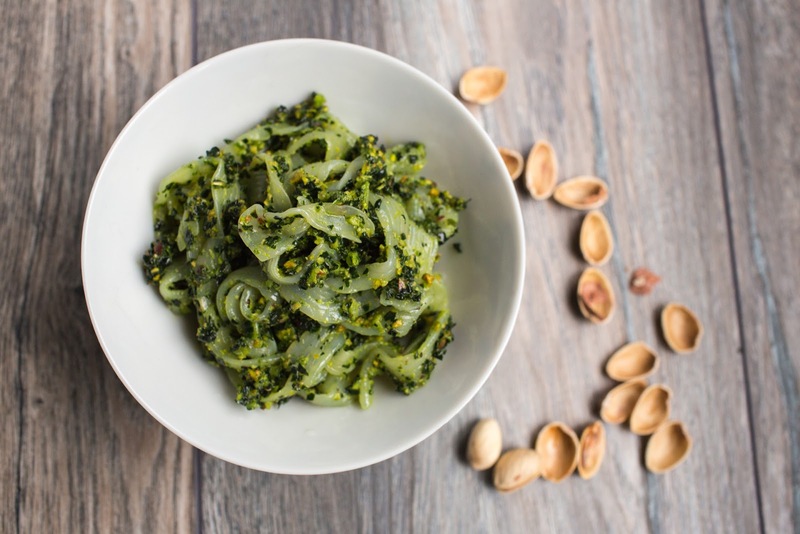 Pesto is a great go-to no-cook sauce when you are pressed for time. Traditionally people think of herbs, like basil, when they think of pesto. 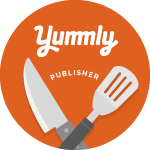 However, there are a ton of variations on this easy, healthy sauce. For all my pesto recipes, I pretty much stick to the formula of greens + garlic + nuts + extra virgin olive oil + extras. 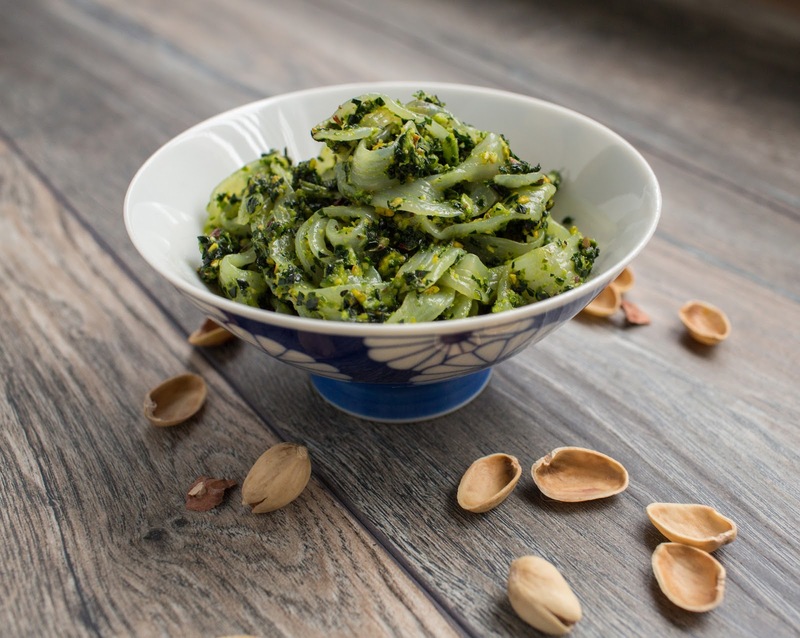 For this recipe, I chose kale as the greens, pistachios as nuts, and lemon juice as the extra. The resulting combo is bold and nutty with a delightful citrus finish. 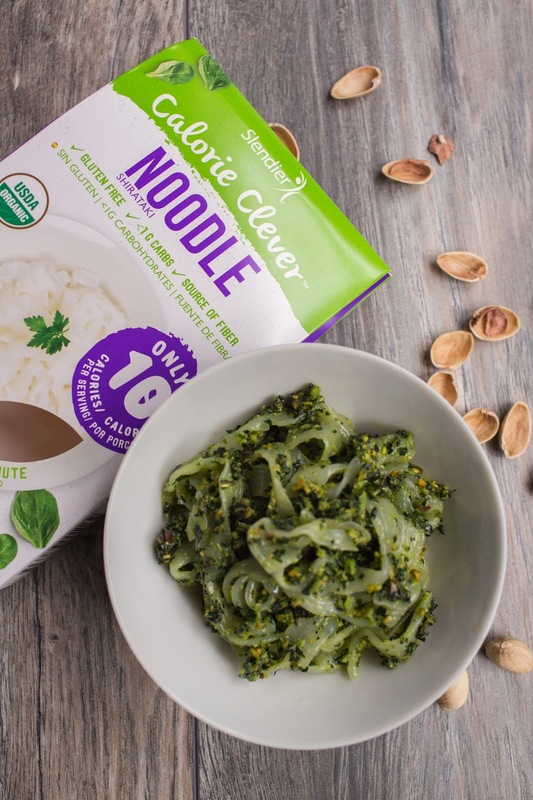 I served the pesto over Slendier Calorie Clever Shiritaki Noodles from my latest Degustabox. The noodles are made with konjac flour. Common in Asian cuisine, the flour is made out of the corm, known as glucomannan, a soluble fiber that is said to possibly help stabilize blood sugar levels, lower LDL cholesterol, and aid in digestion. Oh, and the noodles are gluten-free, certified organic and vegan-friendly. It looks kind of weird, but the noodles come pre-cooked in liquid. All you have to do is drain and rinse thoroughly, then place in a bowl of hot water for 1 minute, drain again and they are ready to eat. Super simple. What are they like? Well, they are flavor-neutral, meaning they have almost no discerning taste by themselves. They have a texture similar to rice noodles with a little bit more chewiness. Renato, who loves seaweed salad, said they reminded him texture-wise of seaweed. While we liked the texture, let’s face it, it’s not going to be for everyone. With that said, this pesto would be delicious on anything from traditional pasta to spiralized vegetables as well as chicken and even fish. In a food processor add kale, garlic, pistachios and lemon juice. Add a pinch of salt and pepper, put on the lid and start the food processor. With the food processor on, stream in the extra virgin olive oil. When the mixture appears well incorporated, turn off the food processor and pour the pesto into a medium sized bowl. Sounds very good, and most likely really good on fish, with the lemon. We usually make our pesto with basil and walnuts, but this variation will be an experiment that we will try! Thanks!